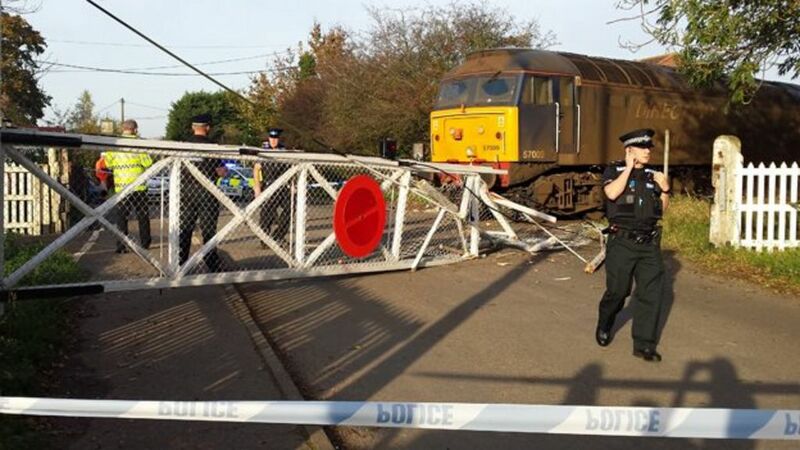 A mistake by a train driver has been blamed for a rail crash that demolished closed level crossing gates in a Norfolk village. A train cleaning leaves from the line between Norwich and Great Yarmouth ignored warnings and hit the gates in Lingwood on 31 October 2014. Network Rail said both gates were 'struck, damaged and removed by the impact' but no-one was injured. Direct Rail Services said it had 're-briefed and retrained' the driver. A mistake by a train driver is blamed for a rail crash that demolished closed level crossing gates in a Norfolk village. Platform scene at Lingwood station, Norfolk, on the line between Norwich and Great Yarmouth, on a warm summer's day in June 2010. The view is east towards the level crossing over Station Road.